I, the Song is an introduction to the rich and complex classical North American poetry that grew out of and reflects Indian life before the European invasion. 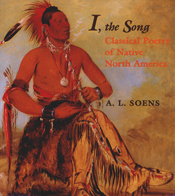 No generalization can hold true for all the classical poems of North American Indians. They spring from thirty thousand years of experience, five hundred languages and dialects, and ten linguistic groups and general cultures. But the poems from these different cultures and languages belong to poetry unified by similar experiences and shared continent. Built on early transcriptions of Native American “songs” and arranged by subject, these poems are informed by additional context that enables readers to appreciate more fully their imagery, their cultural basis, and the moment that produced them. They let us look at our continent through the eyes of a wide range of people: poets, hunters, farmers, holy men and women, and children. This poetry achieved its vividness, clarity, and intense emotional powers partly because the singers made their poems for active use as well as beauty, and also because they made them for singing or chanting rather than isolated reading. Most striking, classical North American Indian poetry brings us flashes of timeless vision and absolute perception: a gull’s wing red over the dawn; snow-capped peaks in the moonlight; a death song. Flowing beneath them is a powerful current: the urge to achieve a selfless attention to the universe and a determination to see and delight in the universe on its own terms. A.L. Soens is emeritus professor of English, Notre Dame University. He lives in Durango, Colorado.